The history of the Reuben sandwich isn’t known for sure, but there’s a few stories that seem to host the most klout. If you’re interested, you can read about them here. Several variations of the Reuben exist, but the traditional Reuben is either cornedbeef or pastrami on grilled rye bread with sauerkraut and either Russian or Thousand Island dressing. I prefer mine with corned beef and thousand island dressing. What’s the difference between Russian and Thousand Island? Thousand island dressing is lighter in color and chunky, containing finely chopped ingredients such as pickles, onions, bell peppers and/or green olives, among other things. Russian dressing is a darker, brighter orange color and does not contain any chunks. I prefer the former. A Reuben sandwich is one of my favorite not-so-healthy foods. If you follow along here you know I prefer gourmet, healthy wraps to greasy sandwiches, but sometimes a Reuben just hits the spot. The good news here is that it is pretty filling, so I normally don’t eat more than half, saving the other half for later or sharing it with my date. A few weeks ago I had been craving a Reuben, so before leaving for vacation we headed over to my favorite NJ diner: The Omega Diner and Cafe in North Brunswick, NJ. I didn’t even have to look at the menu, knowing that I wanted the Reuben sandwich. I did look, though, because you have to be careful! Like I said above, I enjoy mine with corned beef and thousand island, so it’s important to make sure that this is how they serve or that these are at least options. I’m not a fan of the pastrami and Russian dressing version. If you’re scared of corned beef, don’t be! It is salty, tender and juicy. Especially on this sandwich with the cheese, sauerkraut and dressing it all comes together in your mouth as a perfect flavor combination. 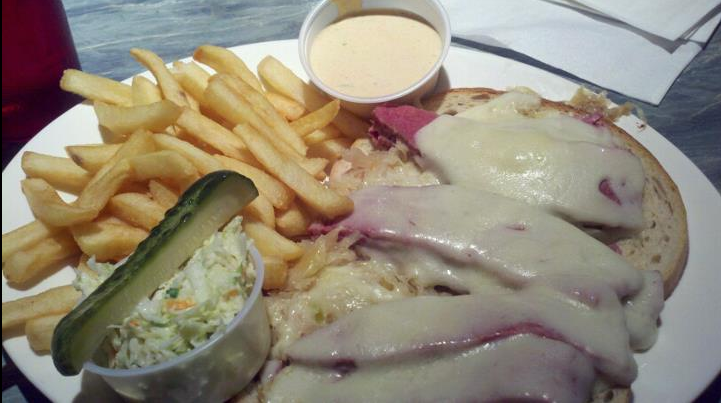 It is traditionally served as a hot, grilled, open-faced sandwich with cole slaw, a pickle and fries. Let me tell you, Omega hit it out of the park. It was a great sandwich; the meat was tender and juicy, not too much cheese, the rye was perfectly grilled and the thousand island came on the side, just how I like it. It was absolutely delicious! Seriously as honestly. So much so that a few weeks later we went back and I got it again! What’s your favorite not-so-healthy indulgence? Do you like Reuben sandwiches? How do you like yours? This entry was posted in Restaurants, Reviews and tagged NJ diners, Omega Diner, reuben sandwhich, russian and thousand island by eatnew. Bookmark the permalink. I hadn’t planned on making an impromptu trip to North Brunswick this weekend, but some things in life you just cannot plan for. I miss that diner! If you can get yourself to make an exception next time you visit, they also make some pretty great Paninis!